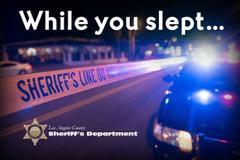 At 11:53 pm, during a vehicle burglary suppression/surveillance operation, plainclothes detectives observed a wanted suspect breaking into two parked vehicles on Melrose Avenue just west of Almont Drive, West Hollywood. The suspect was observed stealing property from the interior of the vehicles and then passing the stolen property off to a second suspect. The second suspect entered a vehicle and drove away. That suspect was detained by deputies a short distance from the location. The first suspect attempted to hide behind a vehicle and was attempting to change his clothes to avoid detection. He was located almost immediately and was detained without incident. During the search of the suspects’ vehicle, multiple pieces of stolen property from burglarized vehicles was recovered. There was also property recovered which was stolen from several vehicle burglaries that occurred in West Hollywood over the last week. Some of the recovered items included IPads, laptop computers, backpacks, wallets with identifications and credit cards, and other miscellaneous items. The male suspect is the primary suspect in many vehicle burglaries that have occurred in West Hollywood this year. He was also wanted on a $250,000 Burglary warrant.